One of the more unexpected objects found by Dallas Abbott in Layer B of the Tamarack Pond [Black Rock Forest, New York] core was a fragment of red coral from the other side of the Atlantic Ocean. Layer B. 382-384 em. Age: 925 ± 76 A. D.
This layer contains at least one undoubtedly transported component, a red coral fragment with two coccoliths trapped in its cells. There is no red coral in the Atlantic Ocean near Black Rock Forest. Precious coral or red coral is the common name given to Corallium rubrum and several related species of marine coral. The distinguishing characteristic of precious corals is their durable and intensely colored red or pink skeleton, which is used for making jewellery. The original species, C. rubrum (formerly Gorgonia nobilis), is found mainly in the Mediterranean Sea. It grows at depths from 10 to 300 meters below sea level, although the shallower of these habitats have been largely depleted by harvesting. In the underwater caves of Alghero, Sardinia (the “Coral Riviera”) it grows at depth from 4 to 35 meters. The same species is also found at Atlantic sites near the Strait of Gibraltar, at the Cape Verde Islands and off the coast of Southern Portugal. 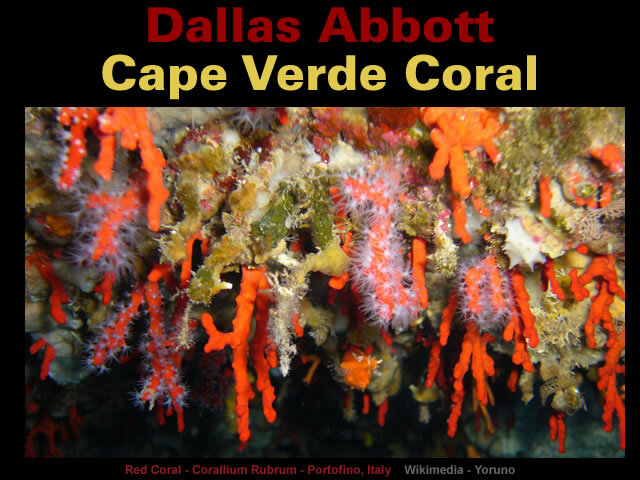 In another piece of remarkable detective work Dallas Abbott determined that the most likely source of the red coral fragment was about 3,500 miles away in the Cape Verde Islands. However. the closest location with red coral is the Cape Verde Islands. One of the coccoliths is Gephyrocapsa. The Gephyrocapsa in Fig. 7 is Gephyrocapsa Equatorial. Gephyrocapsa Equatorial lives at latitudes between 17°N and 17°S . Cape Verde, officially the Republic of Cabo Verde, is an island country spanning an archipelago of 10 volcanic islands in the central Atlantic Ocean. 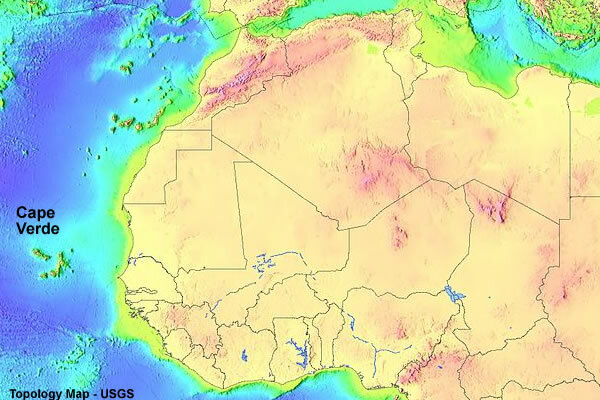 Located 570 kilometres (350 mi) off the coast of West Africa, the islands cover a combined area of slightly over 4,000 square kilometres (1,500 sq mi). The Cape Verde Islands are very curious because [according to the mainstream] the islands were uninhabited for at least 8 million years before being discovered by the Portuguese in 1456 CE. The Cape Verde archipelago was uninhabited until the 15th century, when Portuguese explorers discovered and colonized the islands, establishing the first European settlement in the tropics… The islands of the Cape Verde archipelago were discovered by Genoese and Portuguese navigators around 1456. Magnetic anomalies identified in the vicinity of the archipelago indicate that the structures forming the islands date back 125–150 million years: the islands themselves date from 8 million (in the west) to 20 million years (in the east). The oldest exposed rocks occurred on Maio and northern peninsula of Santiago and are 128–131 million year old pillow lavas. The Cape Verde Islands are also very curious because they appear to have originated only about 400 miles South of the Black Rock Forest at the time of the Permian–Triassic Extinction Event [dated officially to 252 million years ago]. These changes bring the Africa-North America split within spitting range of the “Early Mesozoic” and [more importantly] the Permian–Triassic Extinction Event [252 million years ago] when [amongst other things] “up to 96% of all marine species” became extinct. Aligning these events makes sense because when the Atlantic Ocean began to open up the adjoining inland seas began to drain off into the new ocean. This draining event helps to explain the massive die-off in marine species [especially if the inland seas were predominantly fresh water] and the stranding of seals in [what are now] inland lakes. Tamarack Pond Layer B has been radiocarbon dated to 925 ± 76 AD but its relative position suggests it’s about 300 years older and is associated with the Arabian Horizon at 637 CE. Gallery | This entry was posted in Dallas Abbott, Science. Bookmark the permalink.